Chuck Bower is a dedicated safety professional with a passion for helping others. With experience in the military, public sector, environmental remediation, and construction, Chuck has almost seen it all. Beginning his career as an Air Force Security Police Officer, Chuck found a knack for keeping others safe. After a career as a Firefighter and EMT, he saw first-hand just how devastating poor safety practices could be. Those skills transferred perfectly to the environmental and construction spaces, where Chuck has led safety improvement initiatives for numerous companies. 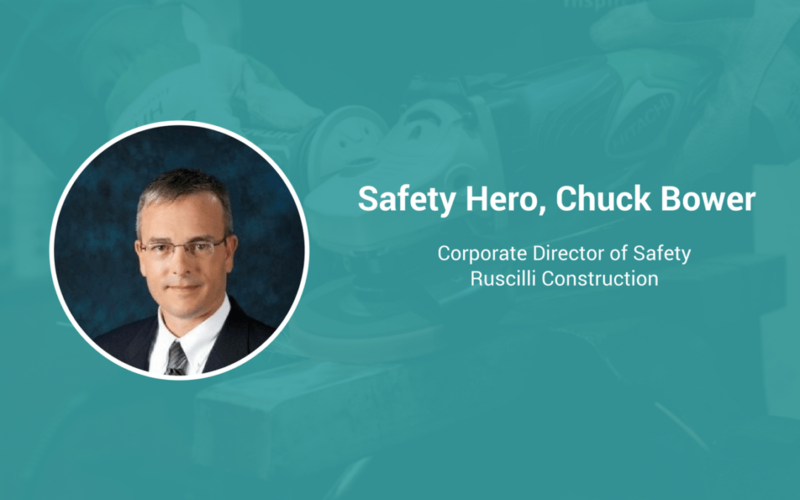 Currently, Chuck serves as the Corporate Safety Director of Ruscilli Construction in Ohio. I chose to go into safety because I’m compassionate about human life. I’ve either seen or read about so many senseless things that have hurt or killed people for no reason that I want to do something about it. I want to do my best to keep senseless accidents from happening so that no one ever gets injured on my watch. It’s critical that safety leaders gain buy-in from all parties within the company. Everyone – employees, coworkers, leadership, contractors, clients, etc. – need to believe in you and your ability to handle safety properly. The best way to do that? Build trust with everyone. While I’ve never had an accident happen on my watch, I’ve seen the impacts that poor safety can have during my time as an EMT. And, I’ve met many people that have experienced incidents on the job, and through their stories, I’ve been able to adapt the way I approach safety to improve our overall program. The most impactful story that I’ve ever heard was from my colleague, Eric, who was buried alive in a trench. He survived, but his story changed my entire outlook regarding what we do. Safety is not an option. It’s the most important thing for any company to focus on. And, safety is about more than just the individual – it’s about their family. When employees are struggling to understand the importance of safety, I always say this: “Imagine that you’re bringing a loved one with you to the site today, and you’re supposed to teach them how to do your job. Are you going to show them shortcuts that are potentially dangerous, or are you going to show them the right way to do things to keep them safe?” The answer is always the way that keeps them safe. I have an ability to communicate at any level without being condescending. I can walk into a boardroom to talk with the CEO of a Fortune 500 company, while also speaking to a worker that’s just started their job in the way that works best for each of them. I can convey the same exact message to different groups in the way that works best for them so that they all work toward the same result. I’d improve the perceived value of safety in the workplace. Many organizations say that “safety is most important” but ultimately the bottom-line controls all. My hope is for all organizations to recognize that safety and profits are directly correlated. When that happens, safety will become a profit drive instead of a bottom-line cost.